Does this mean if I apply for 100, I'll get 25 from each category? People’s Bank Investment Banking Unit which acted as the Manager to the Issue successfully concluded the Rs. 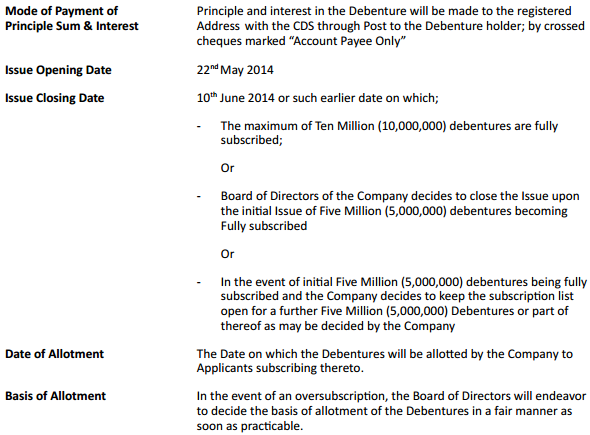 1 billion listed debenture issue of Kotagala Plantations PLC. Total bids received were significantly higher than the issue amount and the issue closed at the end of the issue opening day itself, reflecting high investor confidence in the company and also serves to enhance the success story of this leading plantation company. A significant feature of this issue is the creation of a sinking fund. In order to enhance the credit, the company has set up a sinking fund to pay the debenture holders and the transfer of funds to the sinking fund is on a monthly basis. 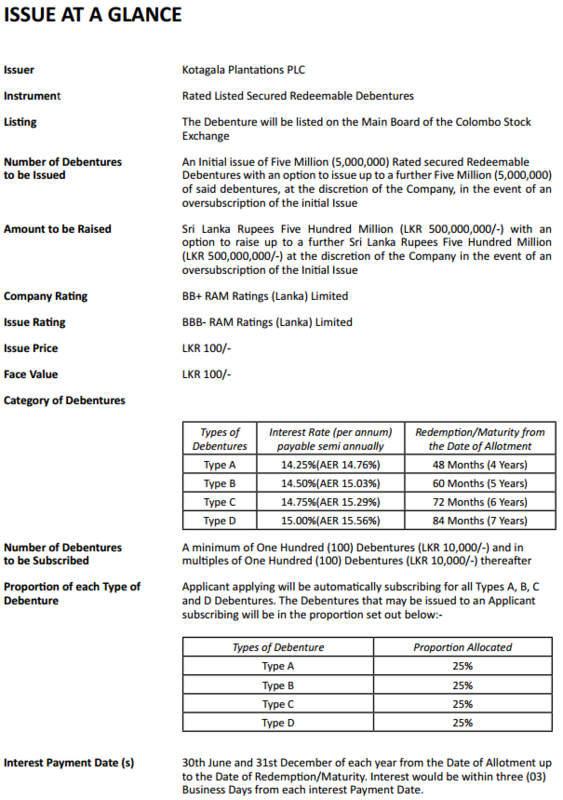 The listed, rated, secured and redeemable debenture issue was assigned a BBB- rating by RAM Ratings and was managed by the People’s Bank’s Investment Banking Unit. The other parties to the issue were trustees – Deutsche Bank AG, Colombo, lawyers – Nithya Partners, registrars – SSP Corporate Services Ltd., bankers – People’s Bank and auditors – KPMG, Chartered Accountants. With nearly 53 years of banking experience, People’s Bank initiated investment banking activities in 2011 with the objective of expanding its footprint to investment banking activities to harness the opportunities arising from the rapid development of the post war economy and to increase its offering to its corporate client base. The Investment Banking Unit (IBU) consolidated its debt structuring activities via asset backed notes, commercial papers and debentures. The IBU has gained a significant market share in this space and has executed a number of corporate debt issues for a number of corporates. The IBU has the distinction of successfully managing the inaugural debenture issues in the spheres of housing finance and the plantation sectors. Going forward, IBU plans to capitalize on the favourable environment present for corporate debt activities, especially with the new tax incentives offered for listed corporate debt and the capital market development initiated by the Securities and Exchange Commission and the Colombo Stock Exchange. Kotagala Plantations engages in cultivation, manufacturing and sale of both tea and rubber, and both products contribute more or less equally towards the company’s revenue and profit. Furthermore, the company is slowly moving in to oil palm harvesting which they are expecting to expand in the future.